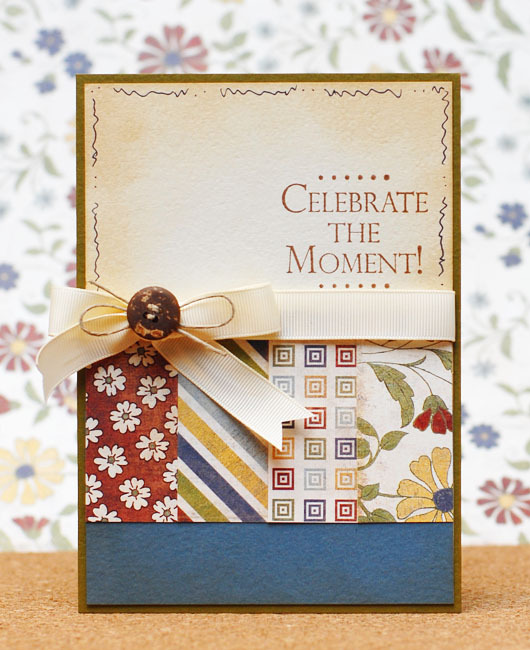 Really Reasonable Ribbon Blog: Celebrate The Moment! Hi there! 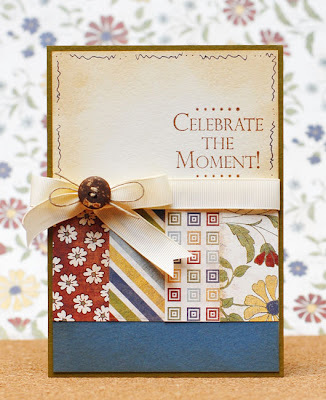 I am having a blast guest designing for Really Reasonable Ribbon this month. I use ribbon on nearly every card or project I create so how could I not be having fun!!!??? Today's card is simple but FUN! This month is the last month for the CPS Card Sketch blog and so I figured I would share my "farewell card" here as well. I love using RRR Grosgrain Ribbon. It ties BEAUTIFULLY. It's weight is great for keeping the shape of the bows loops and tails just the way I want them. I used the Ivory Grosgrain today with just a bit of Hemp and a fun Coconut Shell Button from Buttons Galore & More. Sometimes layering your embellishments like I have here with the ribbon, the hemp and the button adds the oomph the final project really needs! What are your favorite embellishments to layer? This is a great looking card, I love the paper mix on it!!! !